The Urban Natural Assets for Africa: Rivers for Life (UNA Rivers) project, implemented by SwedBio’s partner ICLEI Africa, aims to enable city planning that sustainably manages and integrates the natural asset base. As part of the project, various approaches for community activation in relation to urban planning have been implemented. Participatory planning is a well-known best practice in decision-making processes, especially those dealing with urban natural asset management. It is a powerful way to create social cohesion and bring together people with different ideas, innovations, skills and knowledge (Westerberg and von Heland 2015); an essential in African cities where the needs of vulnerable and marginalised groups are significant. One such planning tool is the use of and adapted version of the popular video game Minecraft. UN-Habitat, through their Global Programme on Public Space, has been using Minecraft as a catalyst to improve governance and increase the levels of participation, efficiency and accountability in the development and implementation of public urban policies. In particular, Minecraft can best enable engagement of youth and marginalised groups in planning. 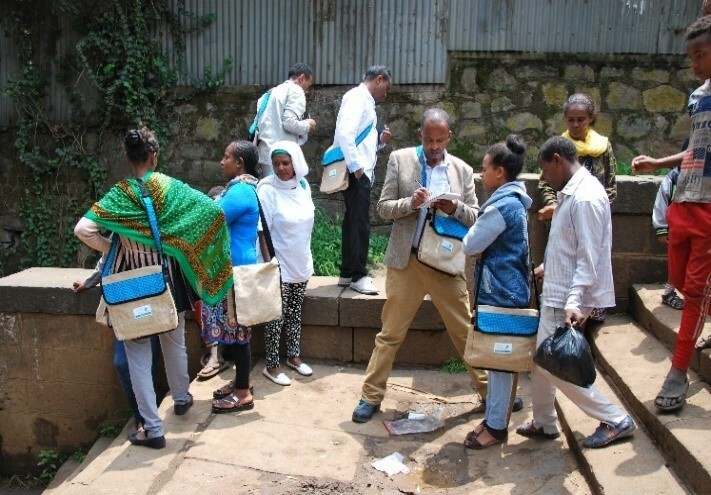 ICLEI Africa, the Addis Ababa City Authority and UN-Habitat held a participatory planning workshop with city officials and community members (with a focus on vulnerable groups such as women and children). Just under 50% of participants were women and over 60% were under the age of 35 years (including three street children who live near the site). During this workshop participants visited the implementation site to get a better sense of the opportunities and challenges on the ground as well as to begin engaging with basic design considerations for public open spaces. A large part of the remaining workshop then focused on the actual design of the site using Minecraft. Participants were divided into smaller groups, where each individual was able to provide design input for the site. The workshop was highly participatory and enriching for all involved; with feedback session and group design presentations woven into the process. Following the initial workshop, the various group designs were consolidated by a group of experts into one final design, which was presented back to participants a few weeks later, for further input. Monitoring, evaluation and learning occurred throughout the process, with interviews conducted in order to assess the outcomes of the Minecraft experience and to better understand how public participation processes can be harnessed to design open green spaces in cities. During the design process, women and youth often held control of the computer-based Minecraft tool, and despite that 58% of participants had never used a computer before, smaller group work allowed mutual learning to overcome this challenge. Participants thus acquired computer skills while also being presented the importance of natural assets in the urban environment. The participatory process was very effective, although many had never engaged with design concepts before, and all plans presented were practical, innovative and cost-effective. Visiting the site seemed to be critical to spark ideas, as well as create important dialogue between different social groups. Having strong community engagement in the process unlocked opportunities to build partnerships between fellow citizens, e.g., those with technical skills in computer use and design concepts shared the process with local community members and together co-produced a plan for a popular open space. 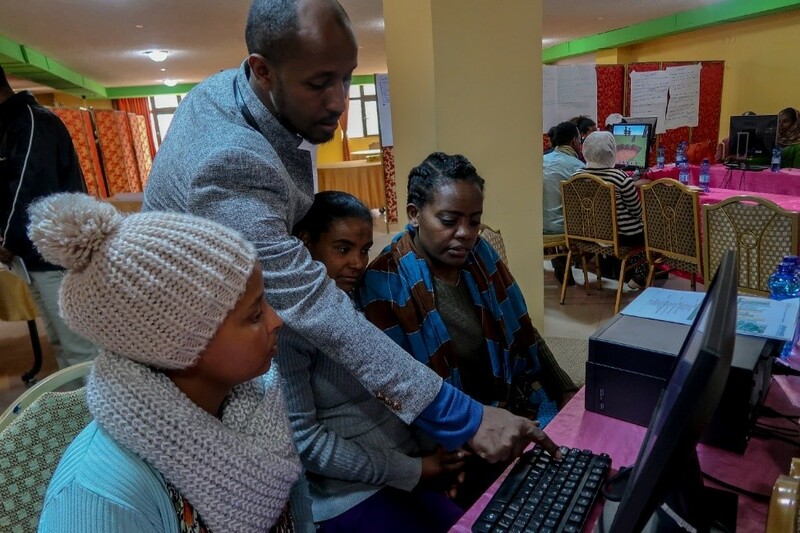 As a participatory planning tool, the Minecraft methodology was found to be an effective means to influence and engender community engagement in an Ethiopian context. The design process and the design outcome were equally important to effectively plan public open spaces, with the aim of improving the experience of sections of the riverbed. Overall, design tools and products provide an incredible opportunity to create important dialogue and partnerships between participants as well as ensure all participants remain engaged and excited throughout the process. 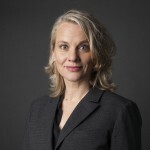 Such bottom-up approaches provide a framework for continued engagement between city officials and other relevant actors and we hope, will ultimately contribute to the sustainability of plans and on-the-ground change. This article was abridged and modified from a ICLEI Africa website post, and is republished with permission of the authors.